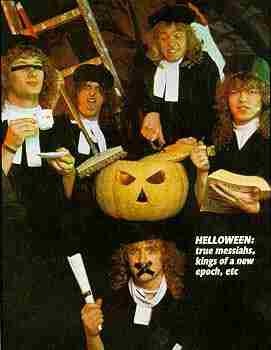 Helloween is a German power metal band. 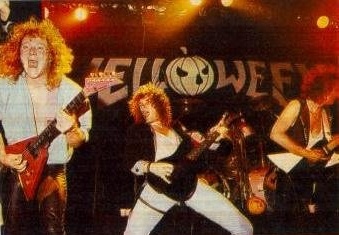 Few bands get to the top and drop out so fast as Helloween. 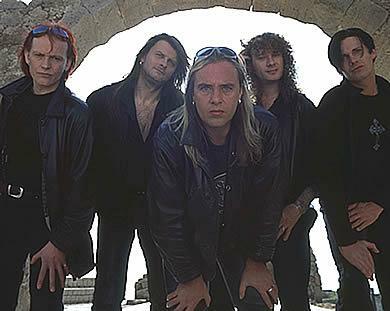 The first name of what will be known as Helloween was "Second Hell", the band started in the beginning of '80's, was composed of three people: Kai Hansen (vocals & guitars), Markus Grosskopf (bass guitar), & Ingo Schwichtenberg (drums). This band changed name to Iron Fist in 1982 then with the entry of a new guitarist Michael Weikath, (who left a band known as Powerfool) the name was definitely changed in Helloween: It was the year 1983!!!. After two years full of specimens finally Noise Records asked them to recorded two songs for a collection named Death Metal (This title had nothing to do with the style of the songs!!!) "Metal Invaders" and "Oernst of Life" (an old Weikath's song at the time of Powerfool). This is can be regarded as Helloween's first album exposure. 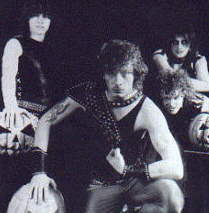 Soon after, Noise released three Helloween albums: a mini-LP simply entitled Helloween, a full-length LP called Walls of Jericho, and the Judas EP. The line-up for all these album were Kai on vocals and guitar, Weikath on guitar, Markus on bass, and Ingo on drums. But this formation changed again in fact while touring to promote these releases, Hansen couldn't sing and play guitar at the same time, so that they searched someone to take his place as the vocalist for the group. So while on tour, they tested Weiki's ability to sing and eventually nabbed the singer for Tyran Pace, Ralf Sheepers. Ralf committed to completing the tour the band, but did not want the full-time position. 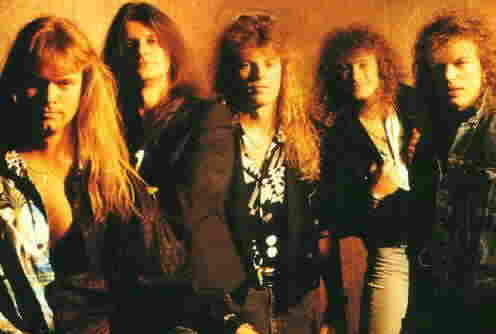 So, after the tour was over,in 1986, they invited an 18-year-old named Michael Kiske to join the band. With this formation were realized authentic masterpieces: Keeper Of The Seven Keys Pt. I (1987) and Keeper Of The Seven Keys Pt. II (1988) becaming particularily popular in Japan, America and Italy too. The band was more popular than ever, but difference of opinion began to occur between Hansen, Kiske, and Weikath. The conseguence of this was the leaving of Kai Hansen to pursue other works. The reason for leaving is mostly disputes with Michael Weikath but also when the rest of the band want to leave Noise records and sign up for EMI instead. Kai will be replaced with Roland Grapow from the band Rampage. In 1991, EMI released the first single from the new album, Pink Bubbles Go Ape, Pink Bubbles was the first album not produced by Tommy Hansen, but by Chris Tsangaris. The band, and in particular, Weiki, was not happy with his job. Tensions began to again form in the band pitting Miki, and Ingo against Weiki and Roland with Markus in the middle of it all. But the band continued on. The tensions in the band got worse and worse in particular with the released in 1993 of Chameleon. But surely the worst episode happened with drummer Ingo Schwichtenberg, who had some schizophrenic hereditary problems. During a show in Japan, he dropped on the floor and started to cry compulsively. While touring, he used to become very depressed, and then this was compounded by euphoric moments caused by cocaine. Helloween lost no time in trying to find a replacement for Michi. They invited Andi Deris (ex-Pink Cream 69) to replace Michi's place and Uli Kusch (ex-Gamma Ray) to the play the drums. In this way the band reuniting with Tommy Hansen to release Master Of The Rings in 1994. This album (for me one of the best) it's very important for the story of the Band because can be considered a "back to the root" after the exspherimental period of Chameleon fortunately not developed. With the stern wind in the 1996 they released The Time of the Oath, a double-live album named High Live. In 1998, they have just released their lastest album, Better than Raw another great and excellent album. In 1999 they decided to do a covers album Metal JukeBox (recorded in 1999 at Fixitinthemix, and Crazy Cat Studios in Hamburg, and MiSueno studios in Tenerife) they decided to not make it the typical covers album. Typical meaning doing covers of 80s metal bands and punk bands, etc. Since many bands do and already HAVE done this. So they decided to put songs by bands they listened to before metal was even around and now you have Metal Jukebox. Many songs on this album you may not have heard, and others you may have heard, but all in all these are all fine renditions to bands who really had a big impact in the music scene and an impact on Helloween as well. Some songs were not even metal but they have been Helloweenized to make them unique! 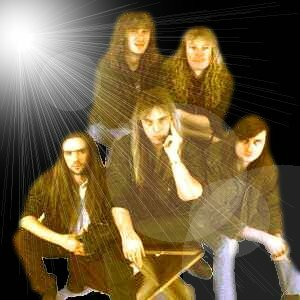 In 2001-2002 The band announces Mark Cross, former Metalium drummer as their replacement for Uli Kusch which was shortlived as Mark caught mononucleosis and was then replaced with Steve Schwarzmann. Sascha Gerstner formerly of Freedom Call was called in to replace Roland Grapow. Rabbit Dont Come Easy : it's a great album, this is what a Helloween album should sound like. If you like Keeper of the Seven Keys don�t think about buying this album, just do it! Michael , Andi, Markus you are the best... continue like that and everything will go fine! Happy happy Helloween, Helloween, Helloween... Happy happy Helloween, ooh ooh ooh!